Global shares were mixed Wednesday, with Europe logging early gains after a lackluster day in Asia. 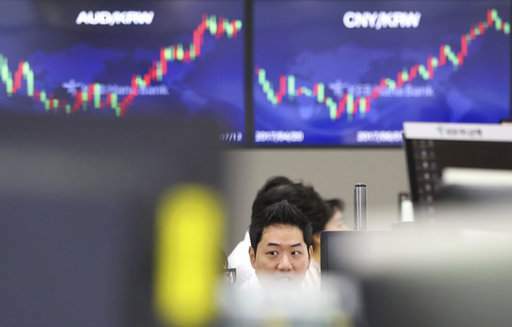 SEOUL: Global shares were mixed Wednesday, with Europe logging early gains after a lackluster day in Asia, as investors eyed U.S. political risks and waited for cues about the direction of monetary policy from the Federal Reserve chair. KEEPING SCORE: Britain's FTSE 100 rose 0.7 percent to 7,379.60. France's CAC 40 gained 0.7 percent to 5,175.21 while Germany's DAX advanced 0.5 percent to 12,495.49. Futures augured a tepid start on Wall Street with both S&P futures and Dow futures up less than 0.1 percent. ASIA'S DAY: Asian stocks finished mostly lower. Japan's Nikkei 225 fell 0.5 percent to 20,098.38 and South Korea's Kospi lost 0.2 percent to 2,391.77. Hong Kong's Hang Seng index rose 0.6 percent to 26,043.64, while China's Shanghai Composite Index slipped 0.2 percent to 3,197.54. Australia's S&P/ASX 200 shed 1 percent to 5,673.80. Stocks in Southeast Asia were mixed. FED WATCH: Investors were refraining from making big moves ahead of Federal Reserve chair Janet Yellen's testimony before the U.S. Congress on Wednesday and Thursday. Traders are watching for cues on the outlook for U.S. monetary policy and the Fed's plans to cut its balance sheet. The Fed is also scheduled to release its Beige Book, an economic snapshot used by the central bank to gauge U.S. economic trends. ANALYST VIEWPOINT: "Markets may not yet be convinced that we'll get a third rate hike this year but they're not dismissing it as they have in the past, either," Craig Erlam, a senior market analyst at OANDA said in a commentary. "Yellen's testimony on the semi-annual monetary policy report will be watched very closely today for signs that the central bank is pulling back at all from its calls for another hike, amid signs that some policy makers are becoming less convinced due to low inflation." TRUMP RISK: U.S. President Donald Trump's eldest son revealed Tuesday that he was eager to hear damaging information about Hillary Clinton from the Russian government and disclosed emails that marked the clearest sign to date that Trump's campaign was willing to consider election help from a longtime U.S. adversary. Democrats in Congress voiced outrage and insisted the messages showed clear collusion, as U.S. intelligence agencies investigate if Russia meddled in the 2016 election. OIL: Benchmark U.S. crude added 79 cents to $45.83 per barrel in electronic trading on the New York Mercantile Exchange. On Tuesday, the contract rose 64 cents, or 1.4 percent, to settle at $45.04 a barrel. Brent crude, used to price international oils, gained 75 cents to $48.27 per barrel in London. On Tuesday, it rose 64 cents, or 1.4 percent, to finish at $47.52 a barrel. CURRENCIES: The dollar fell to 113.39 yen from 113.95 yen while the euro weakened to $1.1452 from $1.1467.